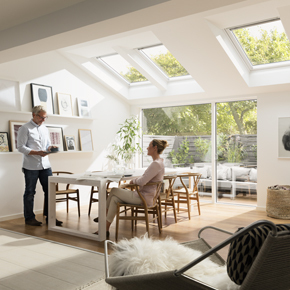 Velux ambassador Sarah Beeny offers tips on how to survive the disruption of building work on your home. Taking on any type of building work on your home, regardless of how big or small the project, can be a very daunting experience especially if you have a young family. Having four young boys, I know all too well how disruptive it can be but including all family members in the process seems to help everyone understand what’s going on and reminds everyone that it won’t last forever. Here are a few of my top tips on how to survive the disruption and make the experience a little more bearable – and maybe even enjoyable! As with most things in life, communication is key. At the very start of the project, ensure that everyone involved is clear of their timescales and workload expectations. Having the family fully involved also helps manage any tense atmosphere and can bring you all together. Try and make it as fun and exciting as possible with pictures of the final project and what the house will look like after the work has been completed dotted around the house to keep everyone motivated. Keeping your neighbours up to speed with all of your renovation plans is also highly advisable. Once building work starts, if your neighbours are aware that there will be workmen on-site or noise from 8am – 5pm, this should keep any potential complaints manageable. It is also a mark of courtesy, particularly if it’s a busy residential street. You’ll want to try to keep your neighbours onside, especially if your plumbing doesn’t get turned back on in time or you are in desperate need of a friendly ear to listen and a hot cup of tea. Dust is one of the biggest problems when renovating your home. Depending on the scale of renovation, I’d suggest keeping one room in the house to be used purely for any valuable pieces of furniture, wardrobes full of clothes and curtains. Invest in some clear tarpaulin and strong tape and cover as much of these items as possible before sealing the room until the renovations are complete. If this is not an option, look into storage units. The cost of doing this might outweigh the hassle or expense of furniture cleaning. Keeping an air purifier in the house also helps with the dust factor. I always think it’s worth the investment getting the builder to spend a day either putting up temporary walls, doors or plastic zippable screens that keep at least some of the dust out and give you cleanish living / sleeping areas. Simple things like keeping doors shut will make a huge difference. It can be hard to decide whether you should keep the family at home throughout the entire renovation or de-camp, finding a short-term lease on a property or staying with family or friends. Personally, I prefer to stay put throughout the entire renovation period. This way you are on-site, can keep an eye on everything and if there are any decisions to be made, they can happen immediately. Some people do find this very challenging, especially if you have a young family. If you’re feeling a little overwhelmed one idea is to mix things up, stay at home during the week and take the family away every other weekend. You can always negotiate a rate with a local B&B if it’s for an extended period of time so you’re never too far away. If you decide to stay and you’re living without a kitchen, the microwave may become your best friend – personally I can’t stand sloppy ready meals so another option is to invest in a small electrical oven with hotplates – you can often pick these up second hand from others who have just been through what you are about to launch into. If you’re living in a massively diminished living space with children, you need to keep on top of the mess. Keeping the precious space you have tidy will save you from feeling overwhelmed. If you don’t have a kitchen sink and your washing up in the bath, keep a large washing up bowl in your “kitchen area” that you can fill up during the day so that you only need washing up in one hit at the end of the day. Minimise washing up where possible – reuse cups, move to paper plates and eat of the saucepan! A large camping water container can also save on countless trips up and downstairs. Planning is key when embarking on a building or renovation project, but once your home becomes a centre of activity, with different trades coming and going every day, it can be easy to lose track and focus. Designate yourself a planning hub or building-free zone in your home where you can set up shop and have everything you need throughout the build to hand. With these simple tips, you and your family can enjoy the experience, and believe me, once everything is finished and you get to fully enjoy your new home, you’ll know all the hard work has been worth it. Take a deep breath and just get on with it.